As we’re in the midst of our “Unsung Women of Jazz” series, a post about drummer/composer/producer Terri Lyne Carrington’s new album, The Mosaic Project, feels rather timely. Not because Ms. Carrington is obscure (with an over two decade career that has included gigs with Herbie Hancock, Stan Getz, Wayne Shorter and most visibly, on Arsenio Hall’s late night TV show in the ’90’s, she’s anything but unknown), but because the jazz on this disc is performed by women only. And what a powerful group of women this is: Dianne Reeves, Dee Dee Bridgewater, Nona Hendryx, Cassandra Wilson, Esperanza Spalding, Helen Sung, Tineke Postma, Geri Allen, Patrice Rushen, Ingrid Jensen, Sheila E. and Gretchen Parlato all make beautiful musical contributions. Though I’ve always enjoyed Ms. Carrington’s work on the drums, I’ve found her albums as a leader to be frustratingly uneven. That is, until now. 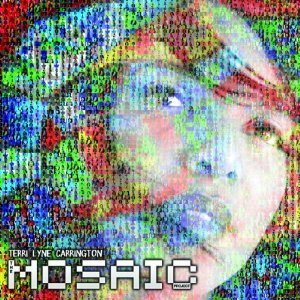 The Mosaic Project is Terri Lyne Carrington’s strongest album, by a mile. Ms. Carrington’s driving, soulful rhythms are always a perfect fit with the diverse contributions of her guests. For me the most memorable tracks were “I Got Lost in His Arms”, the Irving Berlin classic, which gains new life wrapped in an R & B groove and Ms. Parlato’s sensuously ethereal vocals; Bernice Johnson Reagon’s “Echo” with a powerful spoken introduction by Angela Davis, Abbey Lincolnesque vocals by Ms. Reeves and a muted trumpet solo from Ms. Jensen; Geri Allen’s “Unconditional Love”, with haunting solos by the composer on piano, Ms.Postma on soprano sax and Ms. Spalding’s wordless vocal line, floating over the top; “Michelle”, the Beatles’ classic, sounds terrific in a post-bop reworking; and “Magic and Music”, a touching tribute written by Ms. Carrington, to the singer Teena Marie, who passed away suddenly last December. Check out the accompanying videos for a sampling of more. You’ll dig Terri Lyne Carrington and the ladies of her gorgeous “Mosaic”. This entry was posted on July 31, 2011 at 9:29 am and is filed under CD Reviews, Unsung Women of Jazz, Who's New in Jazz with tags Cassandra Wilson, Dee Dee Bridgewater, Dianne Reeves, Esperanza Spalding, Geri Allen, Gretchen Parlato, Helen Sung, Ingrid Jensen, Nona Hendryx, Patrice Rushen, Sheila E., terri lyne carrington, Tineke Postma. You can follow any responses to this entry through the RSS 2.0 feed. You can leave a response, or trackback from your own site. for once we are ahead of you, but how could we not be when a jazz CD by the name of Mosaic appears. We love it.